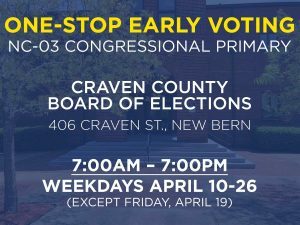 We're gearing up to nominate a great Democratic candidate and get out the vote in the 2019 NC-03 special election! Our 2019 Wainwright Dinner was a huge success, raising funds that will help us organize and get out the vote in the 2019 NC-03 special congressional election and into the 2020 presidential election! At our County Convention last weekend, we elected new county officers who will serve from 2019-2021. We're excited about these new officers and the new vision they'll bring to organizing the Democratic Party in Craven County and turning our county blue! An economy where every family has the opportunity to succeed. Great public schools. Clean air and water. Equal justice under the law. Strong infrastructure. These are American values. These are Democratic values. We are the ones we've been waiting for. We can't afford to sit on the sidelines any more. Find out how you can join us and get involved to fight for the America we all believe in. Democrats across Craven County are organizing to fight for the American Dream. Sign up today to connect with us and find out how you can get involved. Learn about how it all fits together, from the precinct level to the Democratic National Committee. Want to connect with Democrats in your neighborhood? Find your precinct here to get started! Democrats are standing up for the American Dream: an economy and government that works for everyone, not just the few. The Craven County Democratic Party hosted a forum on Monday night April 8th for the Democratic candidates running in the NC 3rd Congressional District special election. Five of the six candidates for the Democratic nomination to finish the term of Walter Jones, Jr. were in attendance, discussing their plans on a broad range of issues including health care, the economy, protecting our eastern North Carolina shoreline, voting rights, and providing constituent services to the whole of the district. Announcing the 2019 Wainwright Dinner! Buy your tickets today for our major spring fundraising event, the Wainwright Dinner—featuring guest speakers Michael Morgan and Anita Earls, Associate Justices of the North Carolina Supreme Court!